What times of year are the bears active? Are there grizzly bears in the park? Where are they? Grizzly bears have been seen at most locations around the Circuit. What do you do if you meet a bear? Stay calm, make noise, back away, leave the area. 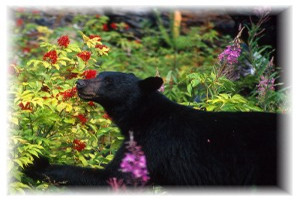 Click here to view the Bear Safety at Bowron Lake web page. Will it attract bears if we make love in our tent? There is no proof of this. Yes, possibly. Bears are very curious and are attracted to unusual odours. Unfortunately, it is best to leave your deodorant at home! Any items that you must bring that have an odour (e.g. food, garbage, mosquito repellent) must be stored in the bear-proof caches provided at all the campsites. What are the bear-proof caches like? Large metal boxes on the ground. Bears cannot open the doors because of the recessed handles. Is bear spray allowed on the circuit? Yes. Please read the information on Bear Safety at Bowron Lake Park and follow all the recommendations for safe travel and camping in bear country. Pepper spray is to be used only as a last resort – do not let your guard down or assume it will prevent bear encounters. If you bring pepper spray, carefully read and follow the instructions provided by the manufacturer. Is it safe for women to visit the park during their period - because of the bears? Bears have been attracted to menstruating women on very rare occasions. Use tampons rather than pads to reduce odours. What should women do with their tampons or pads? Dispose of them in the pit toilets provided at all campsites. If you soap up, can you rinse off in the lake? No. All washing of people or dishes should occur at least 50m back from the shore to avoid polluting the lakes. This applies equally with biodegradable soaps. What do you do with your soapy wash water? Pour it down the toilet hole. Yes, in campsite fire rings only. You must bring a one-burner stove for cooking on, however. Where is the firewood located around the Circuit, and is it dry? You will be given a map indicating woodlots; it is dry when cut into blocks, but may be wet from rain. What should we do with our garbage? Cans: burn to eliminate odours, crush and carry out. Foil and plastic: package in airtight bags and carry out. Do not attempt to burn. Any unburnt garbage left in fire rings can attract bears. What size are the tent spaces? They vary from 8' (1.5 m.) square to 12' (4 m) square. Do the fire rings have grills on them? Are there picnic tables at all the campsites? Do we have to camp with other people? Yes. Please be prepared to share fire rings, cooking shelters and cabins. Firewood is supplied but you may hand-cut fallen dead wood. Are we allowed to stay in the cabins? Yes, but be prepared to share - they are there for emergencies and for drying out wet gear. You must bring a tent. What's in the picnic shelters? What are the cabins like and how many are there? 8 small rustic log cabins (4 persons/cabin). What's the earliest/latest we can canoe the Circuit? Approx. May 1st/October 7th, depending on the ice and snow conditions. What are the water levels like? How is the weather? Check the Bowron web page. During the season the page is updated regularly with the weather and water conditions. What are the portages like and how wide are they? They are well built, 6' (1.5 m.) wide, of gravel and sand. They are designed so that canoe carts may be used. How will the portages be in early June? Soft and muddy in areas. What are canoe carts like? Do many people use them? A two-wheeled metal frame device with a saddle for canoe to sit in. Approx. 90% of the canoeists use them. What is the average length of time to complete the Circuit? When is the Circuit the most/least crowded? Most crowded in July and August; least crowded in May, June and September. What is the average number of people on the Circuit in June/July/August/September.? What is the West Side of the Circuit? Bowron Lake to Unna Lake, or approximately 45% of the total Circuit. It is a good alternative for less experienced paddlers or those who can spare only two to four days. How far apart are the canoe rests? Approximately 1/2 to 1 km apart. What classification is the white water? There is a high volume of moving water in the Isaac and Cariboo Rivers that can be dangerous due to obstacles such as sweepers and deadheads. You must know how to maneuver to avoid obstacles. Any white water of class 2 or higher has a portage trail around it. What hiking trails are there? One to Harold Falls (1/2 km), one to Cariboo Falls (3 km), and one to Hunter Lake (2 km). Are there any canoe outfitters in the area? Any person acting as a guide or offering guiding services in Bowron Lake Park must hold a valid Park Use Permit (Park, Conservancy and Recreation Area Regulation, Section 4). A link to companies that are authorized to conduct guided tours in the park can be found in the Special Regulations under the Know Before You Go section on the main Bowron Lake Provincial Park website. Are there vehicle-access camping facilities? Yes, the Bowron Park Provincial Park campground at the Registration Centre has 25 sites, and the two commercial lodges nearby also offer camping. Do cellular phones work out there? What radio frequency do we use? You are not authorized to use the park's radio frequencies. Seek the help of other paddlers, reach 1 of 6 emergency radio phones (which are located at strategic intervals around the Circuit) and call the Registration Centre for instructions. How long does it take for the Park Rangers to arrive in response to an emergency call? 2 hours to 1 day, depending on weather. What should be packed for food? This is a personal preference. Check for commercially packaged lightweight food (dehydrated), and remember to bring plenty of it - you'll be burning lots of calories. Fresh food may not keep for the duration of the Circuit. Note: no commercially packaged beverages are permitted. Where should I buy food? Is there a store at the circuit? Buy food in your home town. That way you have time to measure out each meal and pre-package it. There are two basic stores near the Registration Centre for last minute supplies. Can you drink the water? What type of filter do you need? Treat it before you drink it with a hand pump type filter that is rated for removal of Giardia cysts, or boil it for 2 minutes. Can I eat off the land? I have 8- & 9-year-old children. Will they make it around the Canoe Circuit? Yes, but you may end up doing the paddling for them. Make sure there are enough strong paddlers in your group to allow for the kids. Are we allowed to take dogs? Are we allowed to take firearms? Where do we leave our vehicle? Is it safe there? Is there enough room for an RV? How much does it cost to park our vehicle? You leave your vehicle in a free parking lot while paddling the Circuit; and there is room for RVs. BC Parks cannot guarantee the safety of your vehicle. However, staff are nearby all day and evening. Always ensure vehicles are locked, and don't leave valuables inside. What is a Voyageur Canoe? Large 4 to 12 person canoe; replica of the fur traders’ canoes. These are allowed on the Canoe Circuit. Can you use ocean kayaks? Yes. Click here for a discussion of canoes versus sea kayaks. How do we get to Bowron Lake Park from Quesnel? Most people drive. Though there is no scheduled bus service, bus/van charters are available in Quesnel; reservations are required. Car or truck rentals are also available. How long does it take to drive there from Seattle? Can we pan for gold? No, natural resources may not be removed from the park. Nearby Wells and Barkerville offer gold panning tours. 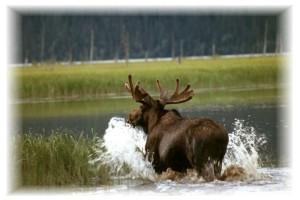 Most park visitors see moose, deer, bear, coyote, fox, beaver, songbirds, waterfowl, and small mammals. How's the fishing? What type of fish are there? It varies season to season - late spring and early fall are best. Species include rainbow trout, char, and kokanee. Do I need a fishing licence? Where do I get one? Yes; at sporting goods stores, the Government Agent's office in your home town (BC only), or lodges near the park entrance. Do we need to bring mosquito netting, head gear etc.? ou won't regret bringing it. I am allergic to bee stings. Are there lots of bees in the area? When are the bugs the worst? What types of biting/stinging insects are there? Mid May through August is the worst time for bugs. You will find mosquitoes, no-seeums, black flies, bees, hornets, wasps and horseflies. 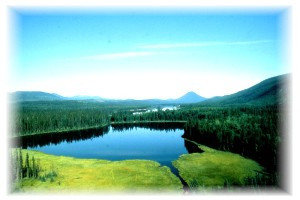 Note: for information on Bowron Lake Canoe Circuit Reservations, click here. How soon should we make a reservation? We recommend at least 3 months in advance to get the dates you prefer. The cutoff for reservations is 2 days ahead of your planned departure date. Can we tentatively book today and call tomorrow to confirm? No. Make a firm decision, than call the Reservation Service. They do not take provisional bookings, and they charge a fee to change reservations. If we reserve from overseas, can we receive a faxed confirmation of our reservation right away so we can book a flight? Yes, tell the operator when you make the reservation. How many people make up a “group”? If we plan to go as a drop-in (without a reservation) and we have to wait for several days for an opening, what is there to do? Swim, fish, hike in nearby mountains, visit Barkerville Historic Town.